Although he was but eleven years old when he came with his father in 1732 to the uninhabited area now comprising Staunton, Andrew Lewis can rightfully be called an Augusta Colonial Founder. Perhaps no other settler had the impact—especially in the field of combat—that he had on Augusta County. Born October 20, 1720, and named after his grandfather, Andrew Lewis was the third son of Staunton founder John Lewis and his wife, Margaret Lynn. Part of his childhood was spent growing up without his father being present, as the elder Lewis fled their native Ireland after killing his landlord and a steward by crushing their heads with a shillelagh. He was later cleared of the charge. The family reunited in 1732 in Philadelphia, moved to Lancaster, then up the Shenandoah Valley where they settled on a creek that would soon bear Lewis’s name, near which he would build a home that he called Bellefonte. The family was among the founders of the Tinkling Spring Meeting House, gathering in a large log building that also served as a fort and a recruitment center for soldiers. By 1745, Andrew became well-known as a frontiersman and surveyor. He surveyed land throughout the valley over the next decade, helping open up new lands in what are now Botetourt and Roanoke counties. 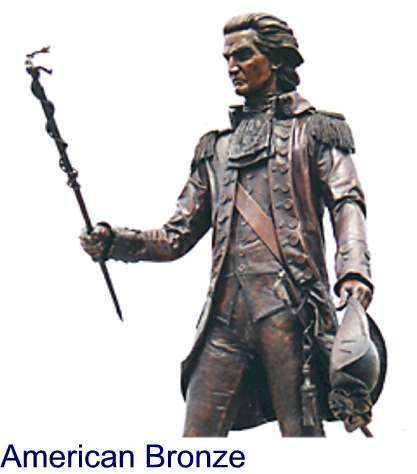 The July 4, 1754 defeat of Washington and the Virginia militia—including Andrew Lewis—was the first in a long line of disasters for the British and colonists at the hands of the French and their Indian allies. Arriving at the Great Meadows on July 1st as a prelude to retaking Fort Duquesne from the French (who had captured it from the British in April), Washington tried to complete the palisade, which he called Fort Necessity, begun there earlier in the year. Although it was poorly sited, designed, and constructed, the palisade was all Washington’s men had for defense, which was now sorely needed. Captain Louis Coulon de Villiers and more than a thousand troops arrived at Fort Duquesne, north of the Great Meadows. They soon set off to defeat Washington and his small force. By noon on July 3rd, six hundred French soldiers and one hundred Indians arrived at Fort Necessity, taking well-shielded positions on an overlooking hilltop. For nine hours in the pouring rain, the two sides exchanged gunfire, resulting in the death of thirty Virginians and only three French. De Villiers proposed a parley, and the next day, with his colors flying, Washington’s force withdrew from the fort. Thus began the seven years war that kept all Europe ablaze while it lasted. It is curious that the first blow was struck in the wilds of America [in what was then part of Augusta County, to be precise] and by George Washington and Andrew Lewis. An even bigger defeat came just about a year later (although Andrew Lewis was not involved) when the famous British general, Edward Braddock, took on the French at Fort Duquesne. Ignoring Washington’s advice, Braddock’s forces were decimated by the enemy and it was only the heroic actions of the Virginia militia that enabled the British to flee without being totally wiped out. In 1756, Lewis commanded the Virginia militia in the debacle known as the Sandy Creek Expedition. This will be the subject of a later article. In September of 1758, Major Andrew Lewis was part of the next attempt to wrest control of Fort Duquesne as a select force of eight hundred British and Virginian troops headed to the fort on a reconnaissance mission. During the night of the 20th, Major James Grant of the 77th Highlanders reached the hill near the junction of the two rivers, and sent a party out to burn a log cabin not far from the fort. At dawn on the 21st, he sent Lewis and a number of soldiers two miles to the rear, ostensibly to guard the baggage, but in reality Grant’s jealousy of Washington and Lewis was so great that he wanted the major out of the way so he would not share in the glory of the anticipated victory. The French force charged from the fort and, bolstered by hundreds of Indians hiding outside the fort, nearly annihilated the Highlanders and Virginian troops. The Highlanders eventually broke ranks and fled, leaving the Virginians to face the onslaught alone. Out of the militia’s eight officers, five were killed, one wounded and one—Andrew Lewis, who fought hand-to-hand with an Indian brave before killing him—was taken prisoner. Sixty-two out of one hundred sixty-two soldiers were killed. Major Grant was also taken prisoner, while most of his men fled into the woods in search of safety. Washington was unaware that Lewis had been captured, and assumed that his friend was killed on the field of battle. Grant, realizing the battle was lost, wrote dispatches to be sent back to Col. Bouquet, the commander of the main force which was many miles away. In them, he laid the blame for the defeat squarely at the feet of Andrew Lewis, even though it was Grant who ordered Lewis to the rear. The courier was captured and Lewis was present when the French commandant opened the dispatches. He was horrified at the lies contained therein, and took off in search of Grant. He charged him with “calumny” (maliciously false statements) and drew his sword, demanding Grant defend himself. The Scottish soldier sneeringly refused. Lewis cursed him as a “poltroon” (base coward) and a liar, then spit in Grant’s face in the presence of two French officers. Lewis eventually served thirteen months as a prisoner in Montreal. There was much more in store for Andrew Lewis, Augusta County, Virginia, and the nation as we will see in the next installment.